Joining our range of equipments is the AMADA ENSIS AJ Series. 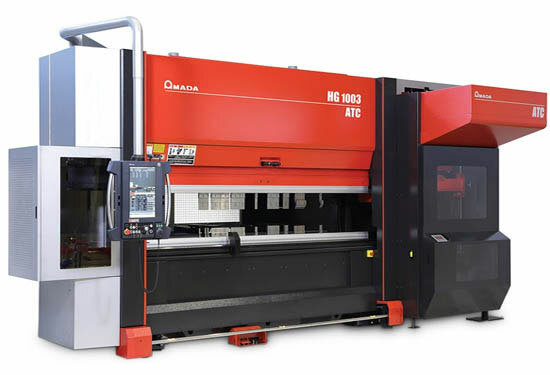 This machine uses proprietary fiber laser technology to process thin and thick materials without a cutting lens.The ENSIS AJ Series achieves high-speed cutting in thin material as well as the ability to process thick plates. The company hosted its employees to an early Christmas Party at the Valencia Lanes Bowling Center. The food was delicious and employees as well as their family members had a great evening. Gifts were provided to all employees present, however everyone had a chance to steal another person's gift as well as swap. The evening continued with lots of bowling fun. Pursuant to our efforts towards continuous improvement of the quality of our customer experience, Alternative Manufacturing and Design left no stones unturned at the recently held Fab-Tech 2016. An executive team was there to see the latest innovations in the fabrication world. As a result we are excited that the best of the fabrication technology machinery will be added to bring even better quality sheet metal production to our teaming customer base. In the weeks to come our valued customers can begin to look to benefiting from our planned manufacturing quality enhancements and unbeatable service lead times. We shall be increasing our capability with the addition of Amada HD 1003 ATC Press Break. The machine is equipped with an ATC (Automatic Tool Changer) which provides unmatched flexibility and productivity. The ATC Press Break has a four-axis manipulator that selects and places punches and dies from the tool magazine.